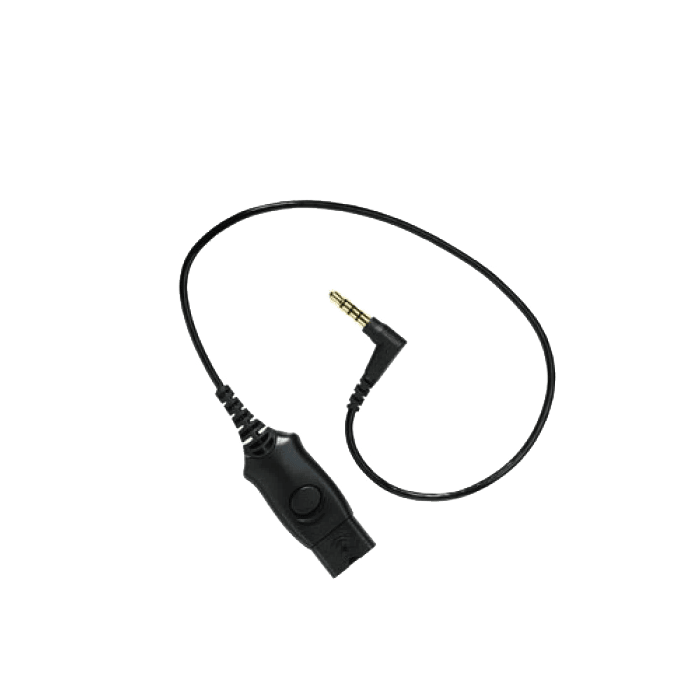 Plantronics 3.5mm iPhone Cable - 38541-02 - Headsets Direct, Inc.
For devices other than Smartphones, please use 40845-01. TECH TIP: Cord length is 12 inches. Reads IP/BB on the quick-disconnect. I am on numerous conference calls daily and blue tooth was painful. Using the adapter I can now use my Plantronics headset with my iPhone. Heaven! This product works flawlessly. I connect it to my cell phone and I use it together with my Plantronics Encore 510 Headset. Now I can speak to people using my headset and my cell phone with crystal clarity all the while laying to rest my secret underlying concern that my blue tooth wireless headset may be in some way radiating my brain with radio waves. I use my blue tooth device all day long when I am away from home. (also a Plantronics product). I’m sure it is safe and wonderful and all that good stuff. But …. it does give me a measure of comfort knowing I can speak on my cell phone without radio transmissions of any kind next to my head. And …. the 3.5 mm connection cord works great with my 510 headset. Wonderful clear communication. It’s nice to be confident that I sound “professional” when I am speaking with prospective clients. Nothing but good to say about this product! This cable works perfectly with Plantronics EncorePro HW510 Headset and a Blackberry Classic. 2) Add a lock to the button on the cord so you can’t accidentally push it when it is laying face down. Works great on the iPhone 5. I have an older Supra Headset that is about 30+ years old. I have it connected to a desktop phone in my office. My employer recently bought me an iPhone 4 as a cell phone, and I wanted to see about using this headset on the iPhone. So far I have tried it on an iPhone and an older LG slide phone (personal phone). My headset works just fine with both phones. I had wasted enormous time and energy attempting to use “consumer” headset products. This connector, along with the new headset, gives my cell phone a quality sound that I had not been able to achieve before. This cable allows me to connect my Plantronics binuaral headset to a Motorola Atrix phone. It works great. The inline button on the cable toggles MUTE on and off without having to load any app on the phone. Sound is pretty good – almost as good as when using the Vista amplifier on my corded phone. I checked with both Plantronics and Headsets Direct that this connector would work with my Blackberry Torch before ordering, but it does not. The pin is too long for the socket. This is perfect for those that are switching between their office phones and their cell phones. I have an iPhone and it works great! 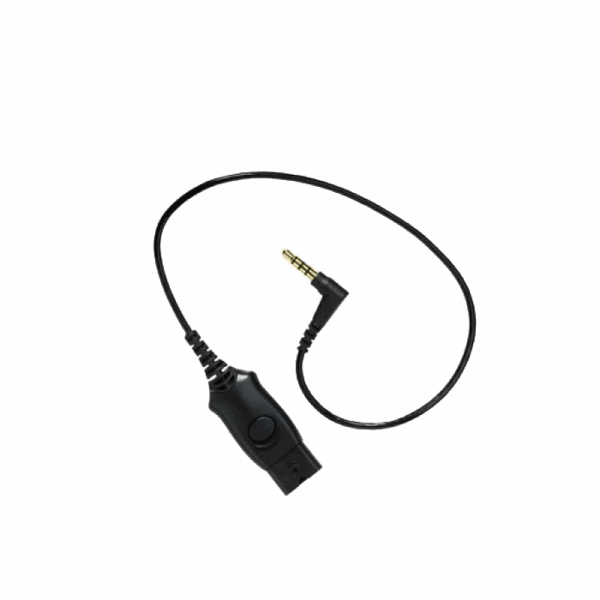 Its a great product and does exactly what I need it to do – it allows me to use my andriod cell phone with a hardwire connection and use my plantronics headset for perfect clarity. Works as advertised – Good buy. It just works. I prefer the noise canceling feature of my professional headset over earphones to use with iPhone during conference calls. This adapter works so well that I keep one at home, one at work, and have given three as gifts.